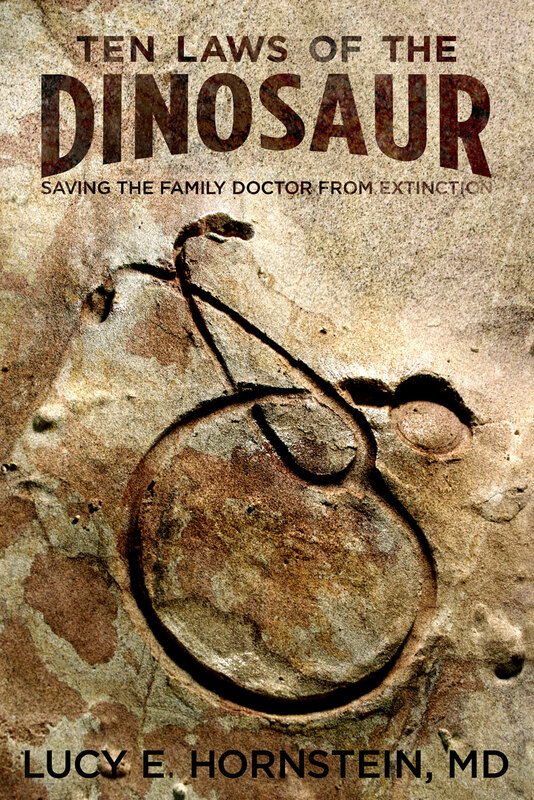 My first book, Declarations of a Dinosaur; 10 Laws I’ve Learned as a Family Doctor, was released by Kaplan Publishing on August 4th, 2009. Sadly, it is now out of print and unavailable publicly (although I do have a few hardcover copies left for sale; email me) however the rights have reverted to me, and plans are in the works to re-publish it electronically (EPUB format) complete with new title and new cover. Stay tuned for when the following link goes live: [BUY IT HERE]. Solo family doctor Lucy E. Hornstein MD looked forward to practicing medicine since childhood. But somewhere between hanging out her shingle and the realities of 21st century medicine, she found herself becoming more and more of a dinosaur. With insight, warmth and biting wit, she shares her unique take on medical practice in Ten Laws of the Dinosaur. Borrowed, adapted and made up, each law contains the seed of a greater truth about modern outpatient medicine. With clarity and humor, Dr. Hornstein relates the growing frustration caused by insurance companies, specialists and unreasonable patients that has led so many other solo docs to throw in the towel, while she continues to battle it out on her own. Illustrated at every turn with stories, vignettes, and anecdotes drawn from real life, Dr. Hornstein will have you chuckling at the ignorant advice from the guy in the health food store, and laughing aloud at the forthright pronouncements of her college genetics professor. Even while drawn into the trials and tribulations of solo practice, the reader will feel Dr. Hornstein’s fulfillment of her calling, as her joy shines through on every page. For those faithful readers (both of you) who tune in regularly, you should know that the book consists entirely of new material that has never appeared on the blog. So even if you’ve read every word of my 700+ posts to date, you can still buy the book and be assured of 239 all-new pages of Dinoblather.